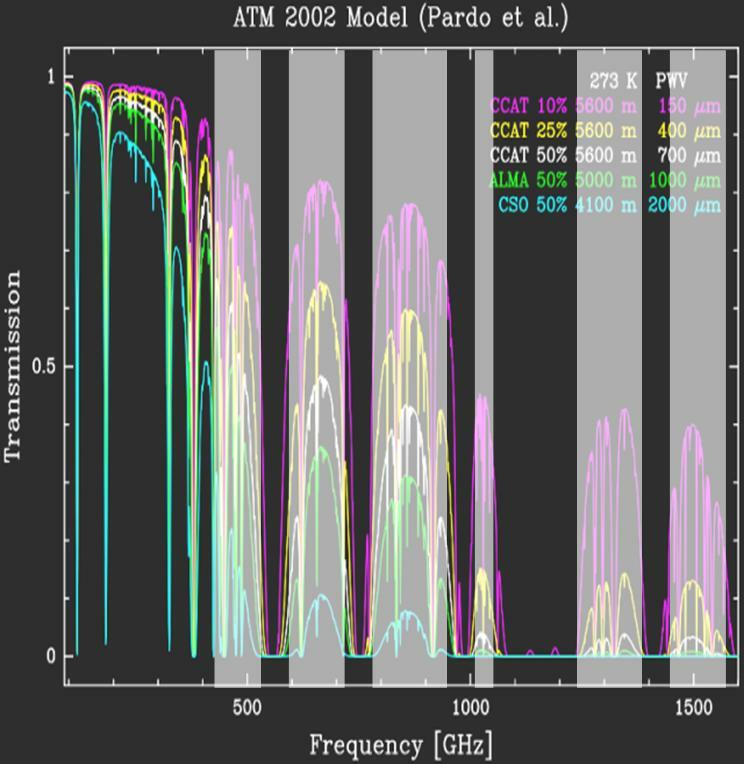 Figure 1 - ZEUS-2 Frequency bands (gray bars) overlaid on atmospheric transmission from various sites (ATM 2002 transmission model from Pardo et al). 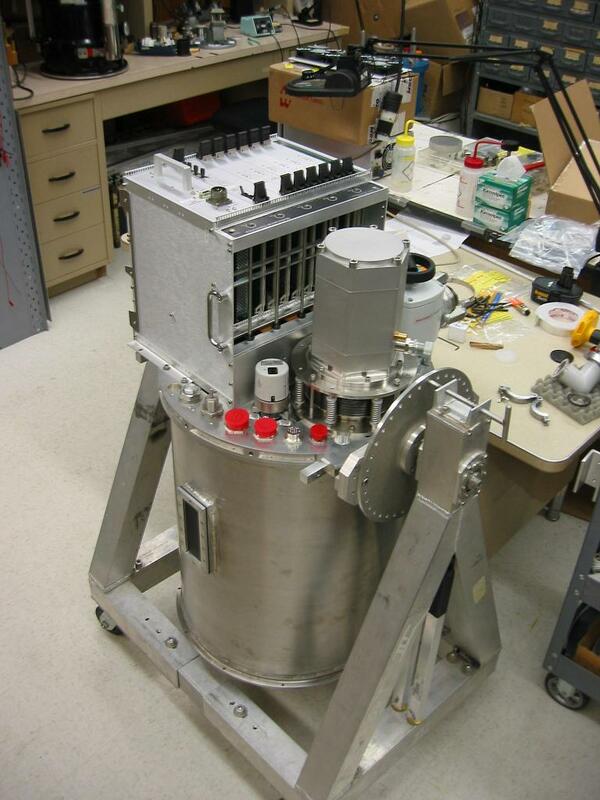 Figure 2 - ZEUS-2 cryostat in its instrument cart with our Cryomech PT-407 and the multi-channel electronics (MCE) from UBC mounted on the top plate of the dewar. Figure 3 - Janis two-stage ADR. - 21.5" OD x 26"
The grating from ZEUS will be transfered to ZEUS-2. All other optical elements are redesigned to maximize the usable field of view (FoV) within the limited instrument envelopes dictated by the CSO and APEX telescopes. The final optics are very similar in concept to those of ZEUS, but we increased the usable FoV from 83 arcsec in the original design to 155 arcsec (CSO values), we eliminated one mirror, and we enabled a larger tilt range for the grating. Figure 4 illustrates our design. The f/12 beam from the telescope enters the dewar window (made of HDPE), reaching a focus just inside the 3 K stage. It is then reflected off of flat mirror M1 onto collimating mirror M2 and through a Lyot stop to M3. The M2/M3 pair change the f/# of the system from 12 to 2.75, appropriate for the detector array. 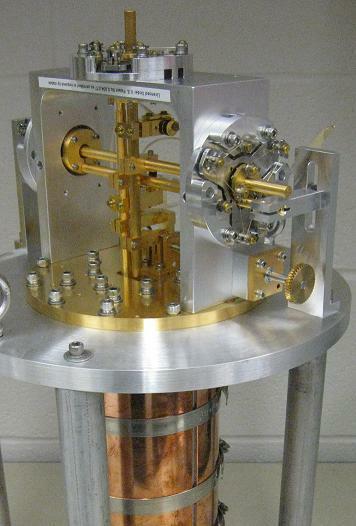 M3 focuses the light onto the entrance slit of the spectrometer, from which it then expands to fill the right half of the collimating mirror, M4. M4 creates a 10 cm collimated beam, which illuminates the 38 cm long grating. The dispersed light returns to the left side of M4, and then is reflected up to flat mirror M5 which sends the beam to the focal plane array. Figure 4 - Optical ray trace of ZEUS-2. Green and blue beams are spatial limits of Array 1. Yellow and red beams are spatial limits for Array 2/3. Figure 5 - Focal plane layout. Array 1 (right) has the top half in 5th order, bottom half in 4th order of the echelle. Array 2/3 (left) operates in 9th (top), and 3rd (bottom) orders. The five bright lines illustrated are observed simultaneouly in extended sources. Figure 6 - Structural mock-up of Array 2/3 (top) and Array 1 (bottom). - ZEUS-2 will observe both [CI] lines at 370 and 609 µm. The line ratio provides a strong constrain on the gas temperature. - ZEUS-2 can observe the optically thin 13CO (J=6-5) line in many ULIRGs and nearby galaxies, thus constraining the CO opacity. This is very important for modeling molecular clouds using the 12CO transitions, which are usually optically thick. 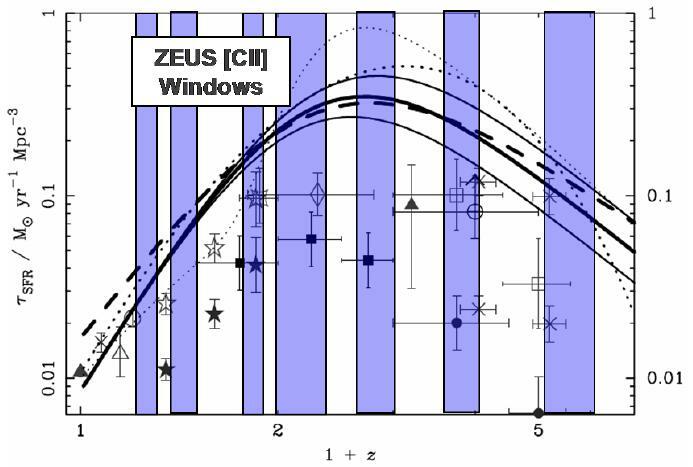 - ZEUS-2 on APEX will observe the [NII] 205 µm line: This line is an important coolant of the ionized gas and in addition reveals the fraction of [CII] emitted from ionized media. 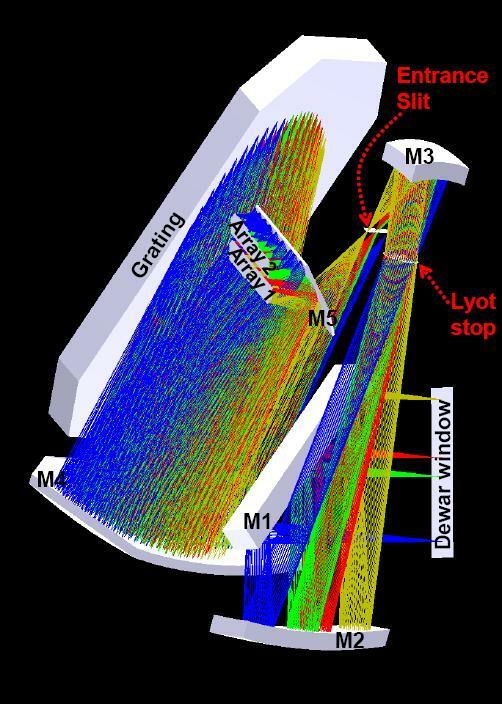 - "Perfect" spatial registration of the lines due to the long slit and multi-line capability. 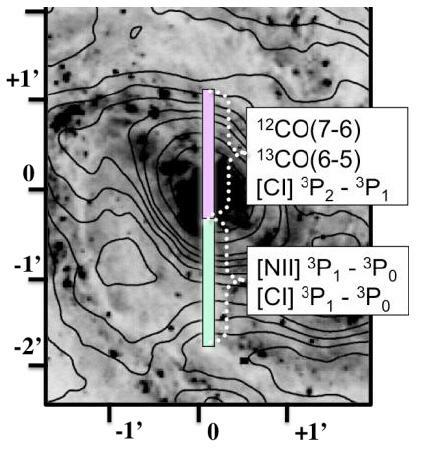 - Simultaneous observation of emission lines in several telluric bands couples the corrections for telluric transmission and thus simplifies the absolute calibration in each band. Figure 7 - Illustration of the ZEUS-2 slit foot-print on M83. 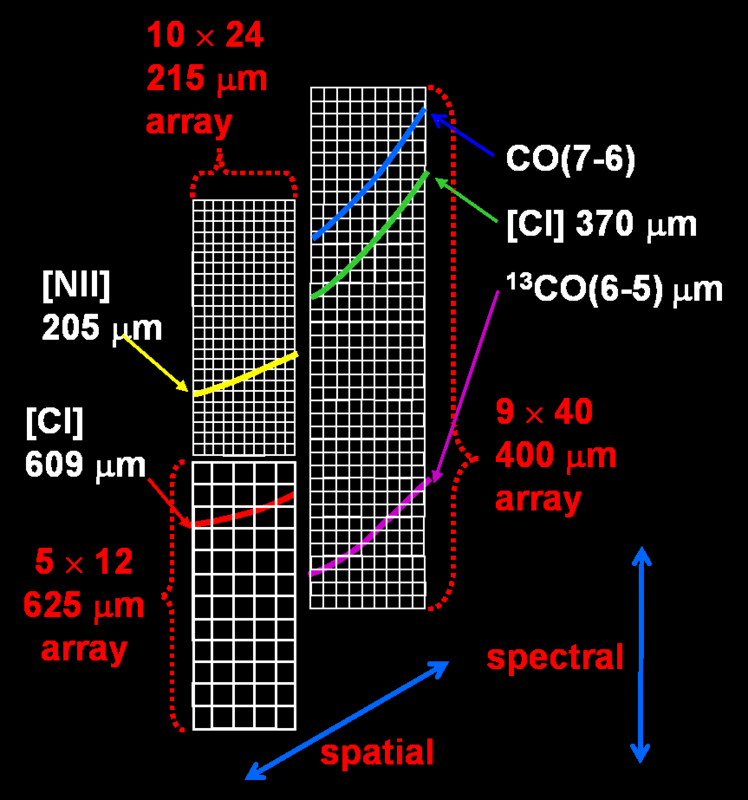 The top half of the slit yields 9 beams in the CO(7-6), [CI] 370 µm, and 13CO(6-5) lines, while the bottom half yields 10 and 5 beams on the sky respectively in the [NII] and [CI] 609 µm lines. Figure 8 - The co-moving star formation history of the Universe (Blain et al. 2002, Phys.Rep., 369, 111). 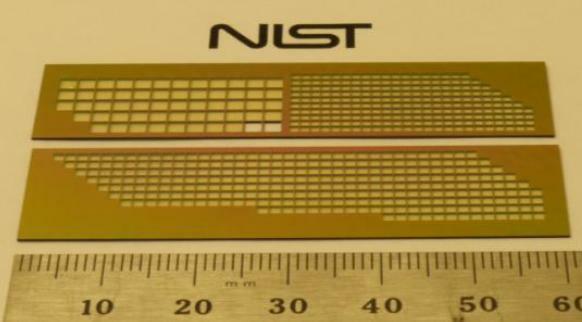 The transparent bars mark redshift ranges accessible to ZEUS-2 in the 158 µm [CII] line. (c) July 2009. Nicki Button.